Fosimo.TR 0.5.3 is available for download. Fosimo.TR is a desktop Twitter app for windows which helps you keep track of your Twitter account without browsing through Twitter. New in this version: ReTweet and Reply from twitter friend window. Did you know? 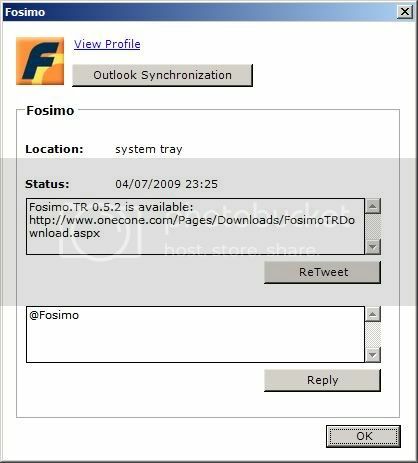 With Fosimo.TR you can sync your twitter friends with outlook contacts. People who use mobile devices with outlook can then see twitter avatars on their mobile phones. Your feedback is appreciated. Heavy twitter users - what do you think is missing? Enjoy and don't forget to follow @fosimo on twitter. Update: 0.5.4 is up with minor fixes and enhancements.